For some time now, Japan has held to an ambitious goal to host 300,000 foreign students by 2020. It looked for a number of years, however, like that target would remain out of reach. But the country’s foreign enrolment growth has begun to gain more momentum over the last two years and, it now appears, could be on pace to reach that 300,000-student plateau by the end of the decade. Year-over-year growth took a big step in 2014, with total student numbers up nearly 10% over the year before. And the latest figures from the Japan Student Services Organization (JASSO) show even greater growth in 2015, with a 13.2% increase compared to 2014. Japan hosted nearly 210,000 students in 2015 and if that growth continues at roughly the same rate through 2020, the 300,000-student target will certainly be within reach. Virtually all international students in Japan (93%) come from other Asian countries, and nearly half (45%) arrive from China. In keeping with a strategy to focus on ASEAN markets, Vietnam has also been an important driver of growth in recent years, with Vietnamese enrolment in Japan increasing by nearly 50% between 2014 and 2015 alone. In fact, Vietnam is now the number two sending market for Japan with nearly 40,000 students enrolled in 2015. Roughly seven in ten (73%) foreign students are enrolled in some level of higher education in Japan, with the balance studying in Japanese language institutes. Japan’s recent progress in growing its international enrolment is bound to get a boost from new measures to boost employment outcomes for foreign graduates. “Japan is hiring foreign talent and it is now a top priority that international students attending Japanese universities stay on in the country, with the government offering new incentives such as subsidised company internships, help with finding jobs on graduation, stepped-up Japanese language courses and more streamlined processes for work visas after graduation,” notes a report from University World News. Many of these new supports arise from the latest iteration of the Japan Revitalization Strategy, which was announced in June 2016. One of its goals: to raise the employment rate of foreign graduates from the current 30% to 50% by 2020. That ambition lines up well with the post-graduation plans of many foreign students. A 2014 JASSO survey of nearly 12,000 foreign students found that more than a third intended to stay in Japan after their studies to find work. More recent surveys suggest that the percentage of graduates who intend to stay and work has climbed considerably higher over the last couple of years. Indeed, new government data finds that a record number of foreign graduates – nearly 16,000 – found employment in Japan in 2015. 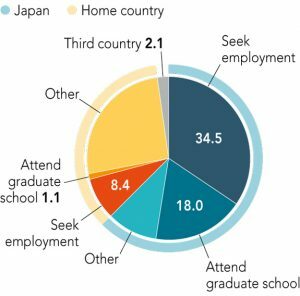 This drive to employ foreign graduates partly relates to Japan’s international recruitment goals, but, more broadly, it reflects a reality of the Japanese labour market in that there are simply more jobs than there are graduates. Thanks in part to a low birth rate and a strengthening economy, Japan has one of the lowest unemployment rates among the world’s developed economies. The active recruitment of foreign graduates by such high-profile employers, the strong job market for university graduates, and the expanding range of career support services and supportive policies for international students all represent a powerful boost to Japan’s attractiveness as a study destination. The early indications are that foreign enrolment in the country continued to grow through the latter part of 2015 and through 2016. Given the prominence of employment prospects in the study abroad choices of international students, all of these developments are likely to play a significant role in Japan’s continuing drive to host 300,000 students by decade’s end. This entry was posted in Asia, Higher Education, Immigration, Japan, Regions and tagged .